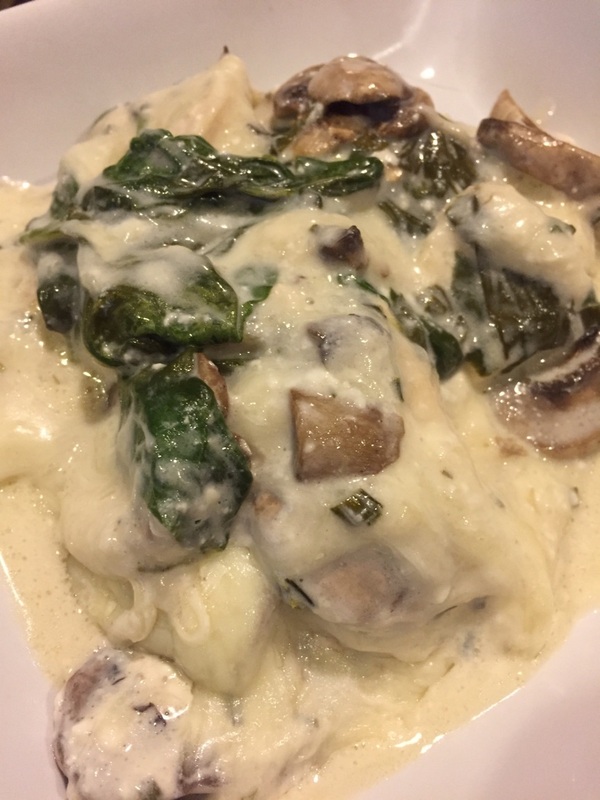 chicken spinach mushroom bake – Mama, Can I Lick the Spoon? Well, call me “Low-Carb Lulu,” because this time, I’m joining him! In fact, we all are. I won’t be quite as strict with the kids’ carb intake, but we are all drastically reducing our carbs. I did Atkins many years ago – sixteen years ago, to be exact. I lost about 60 pounds and promptly got pregnant. We had been trying to conceive for almost 5 years, so we were thrilled. Three years later, I tried Atkins again. Lost 60 pounds. And got pregnant. This one was out of the blue! Of course, God doesn’t have accidents, so we refer to Elizabeth as our happy surprise! My doctor told me the second time that women suffering from infertility are often placed on a low-carb, high-protein diet. That may be why I got pregnant. Or it may just be that I lost weight and that helped me get pregnant. Whatever the case, I’ve been reluctant to try a low-carb eating plan ever since! But here we go! The main problem I have (and have always had) with a low-carb lifestyle is monotony. I tend to get stuck in a rut and start making the same things over and over. I can’t really do that now that kids are involved. I have to make sure that the meals I make are interesting and delicious. Last night, I made something that totally fit the bill! Rich, creamy, cheesy, meaty, delicious. Everybody loved it! Preheat the oven to 375 degrees and spray a 9X13 baking dish with nonstick spray. In a bowl, combine the softened cream cheese, oil, and chicken stock. Whisk until smooth. Set aside. Cut the thinly-sliced chicken into 2 inch pieces and lay the pieces evenly in the bottom of the dish. Sprinkle with salt and pepper. Top with the bag of spinach and distribute evenly in the pan. Pour the sliced mushrooms evenly over the spinach. Spread the cream cheese mixture over the top of the mushrooms. Cover with foil – without sealing or crimping – and bake for 20 minutes. Remove the foil and bake for 25 minutes. 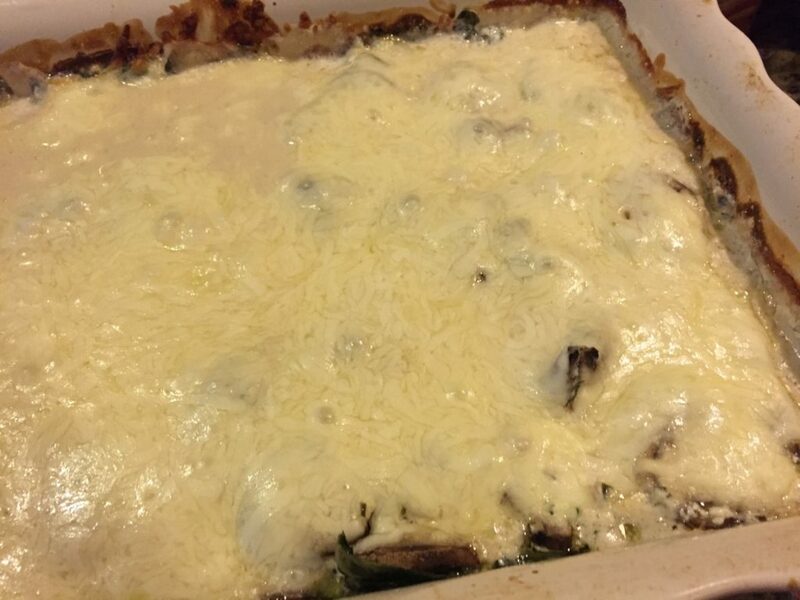 Remove the dish from the oven, top with the cheese and return to the oven to bake for ten more minutes. Well Duh #1: I used the “1/3 less fat” variety of the cream cheese spread. Well Duh #2: I bought already thinly-sliced chicken breasts, but you could certainly slice you own. It would be about 3-4 chicken breasts. Well Duh #3: The dish will seem impossibly piled high, but the spinach cooks down to almost nothing and the mushrooms shrink a bit, too. This was very rich and filling. The oniony flavor from the cream cheese spread gives the dish a great flavor! I even think this would freeze well, but I think you’d have to cook it and cool it before wrapping and freezing it. Low-carb doesn’t have to be boring! I’m going to try to prove that!